As the name suggests, target shooting involves using air rifles and pistols to aim at designated targets. Clay pigeon shooting is an example of target shooting. All forms of target shooting are highly skilled and require lots of discipline, concentration and control. Staying calm is also an important part of target shooting as the line between success and failure is minute. You don't need to have your own equipment to take up target shooting. There are target shooting clubs throughout the UK, and they can provide you with the right guns and other equipment. Choose one that has been approved by the British Association of Shooting and Conservation (BACS). For those who are new to the sport, the main cost will come from joining one of these clubs, but this is relatively inexpensive. Finding one in your local area shouldn't prove too difficult. The Go Shooting website allows you to search for local shooting opportunities in your region. A lot target shooters opt to enter the sport using air rifles and pistols. They have the advantage of costing less than some other types of equipment, and are fairly easy to get the hang of. Although many move on to using other forms of equipment, this isn't strictly necessary. Many target shooters choose to carry on using air rifles and pistols throughout their shooting careers, including professional shooters who use these in Olympic competitions. Clay pigeon shooting is a fun form of target shooting. As is suggested by the name, it involves shooting clay pigeons. 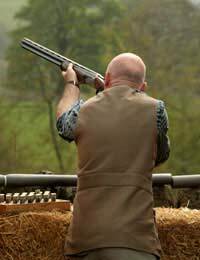 See our article on 'Clay pigeon shooting' for more information on getting involved in the sport. Practical shotgun shooting involves racing against the clock to shoot all of your targets. If you miss a target, you can move closer to the target and try again. As with all target shooting disciplines, a high level of skill and accuracy is needed to be successful. Practical rifle shooting involves shooting targets from a distance of between 100 and 600 yards, although the exact distances often vary. The only necessary equipment is a rifle and appropriate ammunition. To shoot on a competitive level, you'll usually need to have telescopic sight and large capacity magazines, but beginners are not advised to buy a brand new rifle before turning up. Initially, basic equipment will serve you just fine. Target shooting is a flexible sport that lets you set your own boundaries. Once you've learnt the ropes and become a competent target shooter, you can enter a wide range of shooting competitions from the local level (shooting club competitions and events) right through to the national and international level. If you're good enough, you could even find yourself representing your country at the World Championships or the Olympic Games. Unlike many other sports, age isn't a deciding factor in success. Great Britain has won many Olympic medals in recent years, and these shooters have varied in age. If you've got the required talent and aptitude, don't feel that your age will automatically hold you back. I would like some details regarding Target Shooting with Air Rifles, given the name Air Rifle it gives the impression that this is a fairly noiseless sport, is there a significant contrast in the sound of an Air Rifle Target Shooting over a distancecompared to to using Shotguns.